Five Mile works with the best brands in the world to transform popular toys and entertainment programs into engaging books for kids. Trace Moroney is an internationally acclaimed author, illustrator and designer. More than 10 million copies of her books have been sold worldwide and have been translated into over 22 languages in twenty-nine countries. Trace is extremely passionate about creating beautiful children’s picture books with meaningful content – helping to build emotional and social intelligence and show examples of creating positive thought about everyday situations and emotions our children experience. She hopes to motivate her readers to focus on what is good in the world, and the things they love! The Feelings Series is especially designed to help children better understand their feelings and how to identify, manage and express those feelings in an appropriate and acceptable way – both to themselves and others. These books provide an invaluable tool to help build confidence, self-esteem and contribute to a healthy emotional foundation upon which children can thrive. Each book features questions to the reader, which encourages both introspection and discussion about the emotion described. Helpful notes for parents and/or caregivers written by a child psychologist are included in each book. Feeling happy can make you feel bouncy and full of joy! How can you help your child feel happy? Feeling angry can make you feel like you're going to explode! What do you do when your child feels angry? Feeling jealous can make you feel like you are not as important as others... but you are! What do you do when your child feels jealous? Feeling sad can make you feel like you could just cry and hide under the bed covers. What do you do when your child feels sad? Feeling nervous is uncomfortable, but it can mean that you're about to do something really, really brave! What do you do when your child feels nervous? Feeling lonely can make you feel like there is no one else like you. What do you do when your child feels lonely? Feeling kind helps you do nice things for other people and yourself. How can you help your child to be kind? Feeling scared can make you feel like you want to run and hide in a safe place. What do you do when your child feels scared? Feeling disappointed is your brain realising how things really are... NOT how you wished they were. What do you do when your child feels disappointed? Feeling love can make you feel like you belong and are accepted for everything that you are... even the naughty bits! How can you help your child feel loved and be loving? The Things I Love Series has been created in response to research into positive psychology which finds that people with positive attitudes are more creative, tolerant, generous, constructive, successful and open to new ideas and new experiences than those with a negative attitude. Positive thinkers are happier, healthier, live longer, experience more satisfying relationships, and have a greater capacity for love and joy - precisely how we want our children to feel. The series celebrates the everyday situations that form the basis of a child's experiences. There are so many things to love avout being you. From your fingers and your toes and your smile to your dreams for the future. Your birthday is a special and exciting day to celebrate being you! This beautiful book explores the wonderful things to love about birthdays through simple examples and sweet artwork. There are so many things to love about friends. Sharing ideas, interests, feelings and fun times - and learning how to be a good friend. There are so many things to love about school. Bonding with classmates and teachers and learning so many new things. There are so many things to love about pets. A special companion to play with, love and nurture. Sally Rippin is one of Australia's best-selling and well-respected children's authors. Grown-ups and kids all know and trust the name 'Sally Rippin'. Sally has always been a strong advocate for new and emerging authors and illustrators and has quietly, behind the scenes, mentored lots of writers and artists into, and through, their publications. Sally has also dedicated much of her career as an author to creating books that are accessible (both in terms of language, design and affordability) so that as many children as possible can begin on their reading journey. The Sally Rippin Presents list combines Sally's dedication to both new authors and illustrators and accessible books for children. In Moopertown, everyone is special - in their own special way! With humorous, sweet, character-driven stories and a richly-detailed world that children will engage with, this exciting new series celebrates the idea that our differences are what make us unique, and we are all capable of being superheores when we can see the best in ourselves. Co-written with Fiona Harris, one of Australia’s top female performers and writers, having written and performed on television shows, Skithouse, Comedy Inc, Prank Patrol and The Drop Off. She is the author of two books in the Forever Clover series, and has written numerous shows for the Melbourne International Comedy Festival over the past fifteen years. Illustrated by Scott Edgar, who studied Graphic Design and Theatre Production before embarking on a career as a composer, writer, comedian and actor, primarily in the comedy band Tripod. Tripod have been regulars on the international live comedy circuit, regulars on radio and television, and have written musicals for the screen and stage. Super Moopers is Scott’s book series. Markus loves to sing. He can make up a song about just about anything. But not everyone in enjoys Markus's constant singing. In fact, some Moopers find his songs really annoying! Poor Markus. Could there be anyone in Moopertown who enjoys his music? Gertie just can't stop giggling. She laughs at everything - the problem is, not everything is funny! Today is a very important day in Moopertown, but Gertie doesn't seem to be taking it seriously. Poor Gertie. Can she do the right thing for Moopertown's famous visitor? Nellie loves lots of things about Moopertown. But some things make her feel a bit nervous. Pointy hats for instance, and sticky marshmallows. 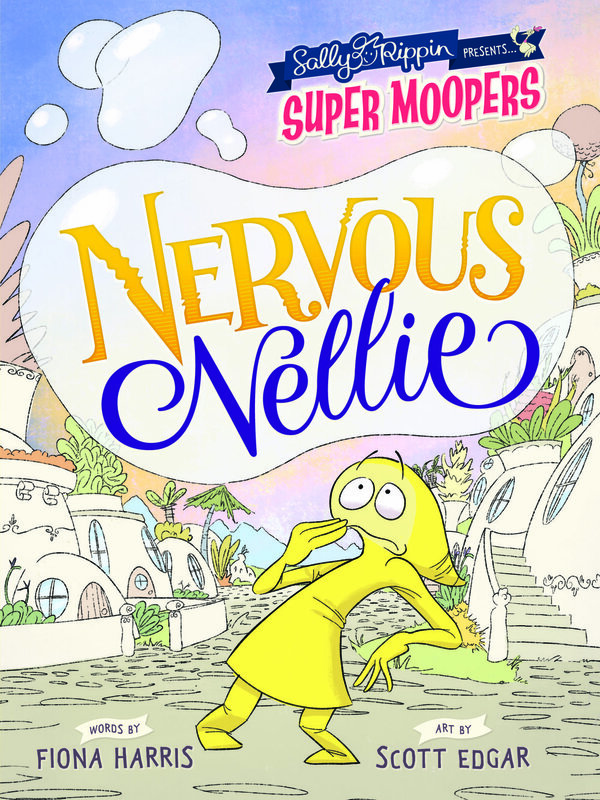 In fact, almost everything makes Nellie feel a little worried. Poor Nellie. Does her nervous nature belong in a place like Moopertown? Abbie just ADORES adventure! She loves spending her days discovering Moopertown and beyond, just like her explorer heroes. But not every day can be filled with adventure - and not everyone appreciates Abbie's quests! Poor Abbie. Can an adventurous Mooper find a little excitement, without annoying her friends? Dom is very dramatic! He always loves to be the centre of attention. As he rehearses for his first ever play he is so excited to show the whole of Moopertown his skills! But some Moopers find Dom's over-the-top ways a bit annoying. Poor Dom. Will his performance be ruined by his off-stage dramatics? Quinn just wants a little peace. It's not that he doesn't love busy Moopertown. It's just that he prefers his quiet life, and his work at Moopertown Museum. But Quinn is so quiet that he's sometimes overlooked by the other Moopers. And sometimes they forget he's even there! Poor Quinn. How does a quiet Mooper fit in a rowdy place like Moopertown?